The structure of the financial industry has to change drastically over the next 10-20 years opined Pranay. All investors, whether institutional or individual, have liabilities/goals which they need to account for while managing their asset portfolios. Investors need to ensure that their assets are always higher than liabilities to minimize the probability of expected shortfall. All institutional investors face a structural/regulatory hard stop loss at a defined Asset-Liability gap. Structure of the business forces a hard stop. Majority of asset management professionals are agents, not principals. The author was asked by the Chinese government as to what his strategy would be to manage a new $100million fund. He points to the rise of sovereign wealth funds in China and Middle East. He started by looking at the traditional Investment process, wherein 80-90% of the risk and return of the portfolio is accounted for by Asset Allocation, with the remainder accounted for by manager selection. However, more than 80% of the asset management industry’s cost and resources are spent on Manager Selection, with only 20% resources spent on Asset Allocation. This mismatch is the primary reason for underperformance of portfolios across the industry. Assumptions of the traditional process are to blame for this mismatch. Pranay proceeded to deconstruct and rebut each of these assumptions. All asset class correlations have risen over time to the point where they no longer provide adequate diversification. Moreover, harnessing the Equity Risk Premium is far from a certainty, even for EMs which have “higher growth”. Even with perfect skill in allocation, there’s still a 90% chance of the portfolio losing at least 12%! Pranay then outlined the limits of the current allocation framework. Everyone follows a single process for allocation, with undue focus on stock/manager selection. No incorporation is made for intra-horizon risk aversion, as only end-of-horizon risk is considered. We align our whole portfolio to relative return. We need to reduce our over-reliance on skill and timing of equity markets, which is a wild goose chase. Pranay focused on 3 important principles for any revised solution- Incorporate multiple processes and time horizons: This will mitigate risk in the portfolio. No process works at all times, as all follow a cycle. Safer to use multiple processes; Design and Implement a true risk measure: The path of risk is more important than end of period risk. Longer the time horizon, probability and magnitude of drawdown rise; Use an exposure based framework: Every characteristic of an investment is both a risk factor and return generator. No concern for active or passive return. Need to understand what part of return comes from skill and luck. On why No clear definition of multi-asset allocation strategy he said investors should look at the capital structure of the firm. Most issues are pertaining to multi-asset strategies. –A staggering 75% of APAC region active managers underperform their respective benchmarks. Amazingly, the number of outperformers further reduces to only 5% over a 3-year period! Top managers in one year wind up in the bottom decile in the next. There is an issue in trying to ape the West. About 70-80% of S&P stocks returns come from stock selection. In APAC, 66% of returns come from asset allocation; only 34% comes from stock selection. Hence blindly copying the West will not work in APAC. Commenting on Fama French paper on skill versus luck, there will always be good and bad managers. It’s more important to have the skill to pick the right manager. Private Equity is same as Equity, except for illiquidity premium. VC is an early stage of equity. Convertibles are a hybrid instrument. Derivatives make it easy to rebalance inexpensively. Manager rebalancing should be for the long term. Beta exposure is cheap, while alpha is expensive. It’s a moot point whether separation of the two has yielded any actual benefits. Illiquidity was not a factor considered by the study. Risk premium buckets should not be mixed. Forecasting factors is difficult. Other relevant issues to consider are fundamental indexing and smart beta. 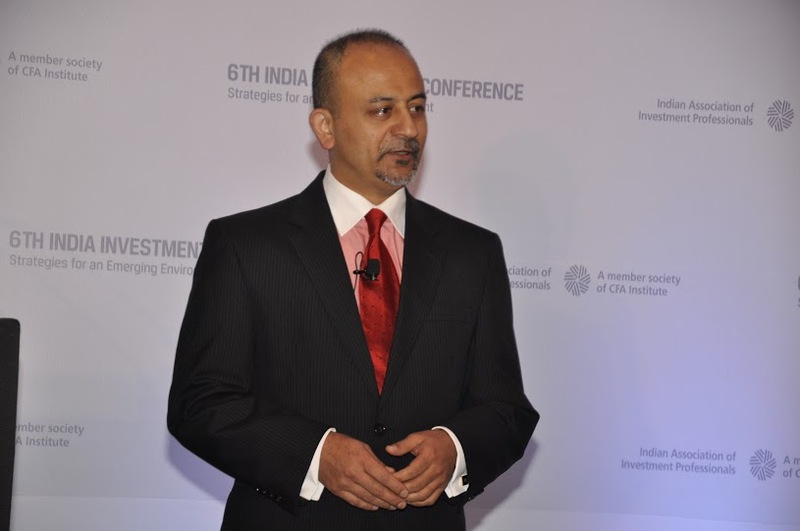 This entry was posted in India Investment Conference, Mumbai and tagged @CFAAsia, @CFAIndia, @CFAInstitute, @iaipcfa, APAC, Asset Allocation, CFA, CFA Institute, Equity Risk Premium, IAIP, Indian Association of Investment Professionals, Ishwar Chidambaram CFA, Madhu Veeraraghavan, Pranay Gupta CFA, T A Pai Management Institute, time horizon. Bookmark the permalink.